This summer has been a scorcher, but it won’t be long before those temperatures start plummeting. Hot summers often mean cool winters which may seem like a relief now but if you’ve got a concreting job you’ve been saving till June, you’ll want to keep the following advice in mind. When laying a slab in cold weather, you have to think about three things – preventing freezing, keeping the concrete strong and avoiding cracking. Here’s how you can do that. Make sure you have a clear plan before you start. That means having all your material, forms and testing devices ready and in place. Check with your concrete supplier about the cold weather protection measurements you need for your mix. Draw up a temperature record chart that includes both the concrete temperature and the ambient temperature. If it’s an unusually cold morning, make sure all frost has cleared before you start pouring. This is particularly important if you live in high areas where the ground itself could be frozen. 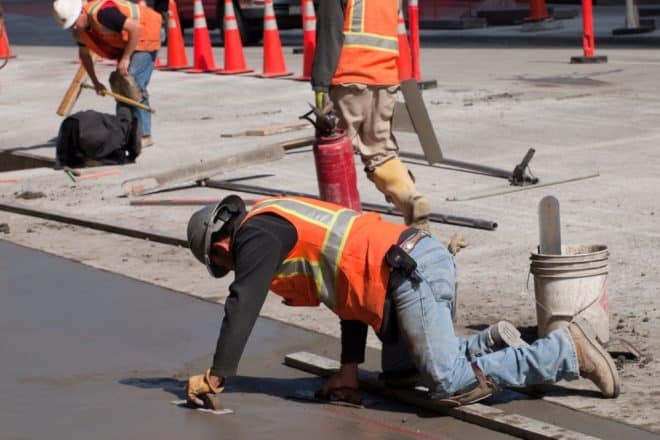 If you’re pouring concrete for a specific purpose and there are strength requirements, make sure you protect the concrete at specific temperatures to ensure these requirements. If you’re going to use a heated enclosure to pour concrete, make sure the elements are in good working order and are windproof and weatherproof. When using a combustion heater, pay particular attention to ventilation to guard against carbonation. To protect against future cold weather, make sure you include air entrained voids so the concrete can cope with freezing and thawing cycles. It’s best to pour for a low slump and use a minimal water to cement ratio. This means the concrete will set quicker and bleeding will be reduced. Concrete curing blankets are useful for preventing freezing and keeping concrete at the perfect temperature for curing. If you’re going to use any finish features like stamping, painting or stencilling make sure all the water has bled out before you begin. Order about 45kg of extra concrete for each cubic metre of concrete. This will help you to add extra cement for increased strength. If you’re concrete freezes in the first 25 hours, you can lose up to 50% of its potential 28-day strength. Only begin to seal the concrete once it has bled and set. Purchase your concrete from as close to the pouring space as possible. It’s better to get it set as soon as possible, and if it has to travel a considerable distance, this can create complications. If you’re concrete is due for a seal, you should do this before winter. It will help to block any pores in the concrete which prevent water absorption and subsequent freezing. If you really want to look after your concrete, do this once every two years or so. Make sure your concrete is nice and clean. Remove any petrol, grease, oil and other chemical spills before winter sets in. Never use de-icing products. These will ruin your concrete, especially in winter. You’re better off using sand or kitty litter to prevent any slippery ice build-up. Make sure you look after your concrete in colder weather. Try not to keep heavy vehicles parked on it for too long and be careful about other heavy loads. Any increased weight will increase the chances of cracking. Keeping it clean is essential. Just keep an eye on your concrete and try and sweep any soil, grass or other debris that has been deposited on your cement by the wild winter winds. You should also ensure your concrete is draining well, as any freezing water could pit your concrete. Using the right tools is essential. Only use plastic shovels and soft-bristled brooms to clean your concrete. Metal tools can create scratches and pits, and that offers the chance for water to get in and create expansion and freezing within the slab. Sound a bit complicated? Well, that’s because it is. Concreting is a fine art and a science. It’s all about having the measurements in your head but having the eye to know if you’re getting it right. Everlast Services are Melbourne’s favourite concreters. Get in touch with us for the perfect pour.